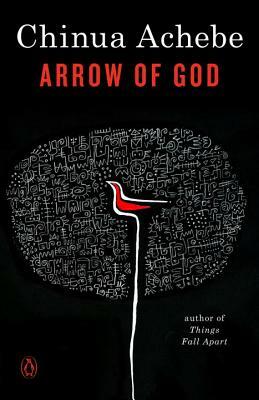 This is the final book in Nigerian author Chinua Achebe's African Trilogy. I have read the first two, Things Fall Apart and No Longer At Ease. All three novels do a remarkable job of showing the culture clash of an indigenous people with their colonial invaders. In fact, Achebe is considered the originator of the genre in Africa. This one spotlights the religious aspect. Ezeulu is the Chief Priest of Ulu, god of six Ibo villages in Eastern Nigeria in the second decade of the 20th century. The British presence there is represented by a District Officer, Captain Winterbottom with his crew, and a Christian Mission. After a war between two villages, which Ezeulu had been trying to prevent is stopped instead by Captain Winterbottom, the Priest comes to respect the power and influence of the British. He even sends one of his sons to learn Christianity in an effort to discover the secret of such power. The Priest's power comes from recognition by the villagers that he is their god's representative. However, there are some naysayers who disagree, even among Ezeulu's extended family. His son expends his newfound Christian zeal by attempting to kill a sacred royal python. That act creates an uproar among the villagers so Ezeulu chooses to renew his opposition to the British with mixed results. I felt I got to know these native Nigerians, as I also did in the earlier books. I was immersed in their family relations, their traditions, and the confusion a foreign culture brings to their ancient ways. Ezeulu is a deeply drawn character. As I am sure Achebe intended, my sympathies were with the Priest. The tragedy he so thoughtfully and cleverly tried to evade was devastating when it came. Chinua Achebe's ability to blend his descriptions of village life and Ibo beliefs with a humorous take on British bewilderment in the face of such difference does more than any amount of journalism can do to present the full scope of such a scene. I haven't read this, although I've often thought about reading Things Fall Apart as it's such a classic. Thanks for reminding me about Chinua Achebe's books. You are welcome. They are such great novels. fitting conclusion to the trilogy. Glad you liked it as much as you did the others. I found Things Fall Apart quite fascinating when I read it last year. I haven't progressed to the rest of the trilogy yet, but I will one day soon. Your review of this book makes me want to move the other two up a few notches on my TBR list. Good! Whenever you get to them, it will be worth your time. Curiously I read the three books over several years but fell right back into Achebe's world with no trouble. I didn't realize that Things Fall Apart (which I have not read by the way) was part of a trilogy! Chinua Achebe's entire African trilogy sounds really good. If you like Things Fall Apart you will like the whole trilogy, I promise! I agree with your last line about journalism -- a novel from an insider can do so much more! Impressive that you've read all three. He was a trail blazer for Nigerian writers. Think of all the Nigerian authors who have published since, especially Chimamonda Ngozi Adichie.